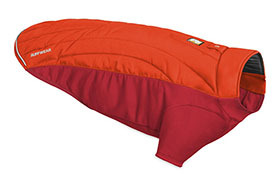 Ruffwear's warmest winter dog coat. The Powder Hound is a hybrid jacket that offers the warmth of synthetic insulation while allowing for a full range of motion because of it's technical stretch fabric. This weather resistant and insulated jacket is ideal for the coldest weather journeys. Your dog will thank you.